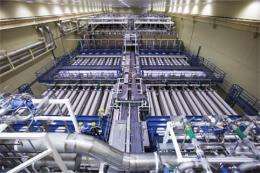 (PhysOrg.com) -- The National Ignition Facility (NIF) at Lawrence Livermore National Laboratory in California has set a new record for a laser shot. This past week, its combined 192 lasers fired a single 1.875-megajoule shot into an empty test chamber. After passing through the last of its focusing lens, the shot reached 2.03 megajoules, making it the first 2 megajoule ultraviolet laser. Prior to this achievement, the most the facility had managed to coax out of the laser, the worlds largest, was 1.6 megajoules. Also, the new record shows that the NIF laser is capable of producing more than it was designed for, which was 1.8 megajoules. It also proved that it was capable of doing so without damaging its parts, allowing for another shot a day and a half later, which is important, because one of the goals for the laser is to get it to fire off shots at 15 per second eventually. Thats what researchers think will be needed to produce power economically from the laser system. The ultimate goal of the NIF is to figure out a way to use a laser to produce nuclear fusion in a way that gets more energy out than is put in. Currently, that goal is still a ways off. Thus far, engineers at the project haven't even reached the break-even or ignition point, though they expect that to occur sometime this year. Tweaking the laser to produce more than it was designed for is a step in that direction. The NIF facility was designed to produce a fusion reaction by imploding hydrogen isotope pellets using the huge laser. To that end, the team has made steady progress. When the project first began eighteen months ago, it had just one percent of conditions in place that are believed necessary to achieve the ignition point. They have improved that mark to ten percent and its because the pace has picked up dramatically in recent months that they believe they will achieve the ignition point sometime over the next six months, which is when the original ignition campaign was slated to end. Technicians adjust the target positioner inside the NIF Target Chamber. Because the facility is funded by the US nuclear weapons complex, there has been debate about whether it would ever be used to prove or disprove the idea that lasers could be used to create nuclear fusion to produce electric power. Having the laser break records doesnt really resolve that argument in the short term, but it might in the long run if it does eventually show that electricity could be created economically using such a process. The National Ignition Facility (NIF), the world's most energetic laser, surpassed a critical milestone in its efforts to meet one of modern science's greatest challenges: achieving fusion ignition and energy gain in a laboratory setting. NIF's 192 lasers fired in perfect unison, delivering a record 1.875 million joules (MJ) of ultraviolet laser light to the facility's target chamber center. This historic laser shot involved a shaped pulse of energy 23 billionths of a second long that generated 411 trillion watts (TW) of peak power (1,000 times more than the United States uses at any instant in time). The record-breaking shot was made March 15. The ultraviolet energy produced by NIF (after conversion from the original infrared laser pulse to the final ultraviolet light) was 2.03 MJ before passing through diagnostic instruments and other optics on the way to the target chamber. As a result, NIF, located at Lawrence Livermore National Laboratory, is now the world's first 2 MJ ultraviolet laser, generating nearly 100 times more energy than any other laser in operation. Satisfying the NIF objective coincides with the third anniversary of the startup of NIF operations in March 2009, when 1 MJ operation was first achieved. Since then, NIF has increased its operational energy about 1 kilojoule each day for three years, a remarkable achievement. Today, NIF is fully operational around the clock, completing important steps toward the goal of ignition and providing experimental access to national and international user communities. The 1.875 MJ shot exceeds NIF's original design specification and sets the stage for full-power experiments over the coming months. 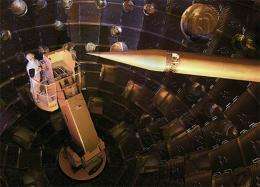 Not only did the shot achieve the highest recorded energy threshold, it also was one of the most precise ever fired at NIF: The energy produced was within 1.3 percent of its goal. Such precision is vital because the energy distribution among the beams determines how symmetrical an implosion is obtained in capsules containing fusion fuel. Implosion symmetry is a critical factor in achieving the pressures and temperatures required for ignition. Moses said that NIF will pursue operations at even higher power and higher energy levels to achieve ignition. "Our facility's ability to demonstrate this level of precision performance as part of routine operations is a testament to the efforts of multiple teams supporting laser operations, target chamber operations, transport and handling and optics refurbishment," Moses said. "For the past 15 years, since NIF groundbreaking in 1997, the scientific community has regarded the 1.8 MJ milestone as a tremendous technical challenge," said NIF Operations Manager Bruno Van Wonterghem. "In 2003, we demonstrated this performance level on a single beam line, and in 2008 we repeated the demonstration on a single quad of four beams. To achieve this performance level with this kind of precision, quality and reliability on all 192 beams is unprecedented and very exciting." Van Wonterghem points in particular to the enormous progress NIF scientists and engineers have made in economically maintaining the facility's optics system while operating at unprecedented energy levels. OK, we made a nice spark, but will NIF work? "Thus far, engineers at the project havent even reached the break even or ignition point, though they expect that to occur sometime this year." It also proved that it was capable of doing so without damaging its parts, allowing for another shot a day and a half later, which is important, because one of the goals for the laser is to get it to fire off shots at 15 per second eventually. Seems like there is still a bit of work tobe done. How do they plan to harvest the generated heat? Via steam and turbines? How will they continuously feed the fusion reaction? A feedback loop is needed for a perpetuum mobile. How do they plan to harvest the generated heat? Via steam and turbines? Yes, evetually. But not at the NIF. That's just a research facility. How will they continuously feed the fusion reaction? Via continuous injection of pellets by gas gun (NIF aims for 15 a second). I get the feeling this program is a cover for a Death Star Laser? OK, we made a nice spark, but http://arxiv.org/...229.pdf? Doesn't matter does it? Making a nice spark is well worth the effort. We need to know how to do this. Okay now we know how to do this, can we shut it down? No we don't know how to do 'it' yet. We don't know how to do it 15 times a second, we don't know how to capture or direct the resultant energy, and we certainly don't know yet how to shrink the whole apparatus to fit into the engine bay (or weapons bay) of a spacecraft. And these are things which we absolutely must know how to do. Because... sooner or later, somewhere, someone WILL. and soo it becomes imperative that we are the first ones to do it. After all we are the good guys, right? This beast is not going away. Just like hot fusion, algal fuel and pv, it will only feed on more and more of our unending cash and never pay it back. I don't understand your fundamentalist attitude and it leads me to believe you're either a troll or a shill for some special interest group. Algal fuel is damn near viable, and the USAF is already using test blends. Commercial aviation is also very interested. Photovoltaic is also a mature technology. Its obviously not *the* solution to energy problems but it works for certain areas and applications. Have fun trolling though, nobody takes you serious. even though this is designed to produce energy is it designed to capture energy as well??? At first i thought wow - no ITER but NIF might be better -- then i thought this is probably the ignition for ITER either way --- can this facitility capture the energy it will produce?? link answer to an article. My fundamentalist attitude is due to the fact that there is a finite amount of research money and hot fusion has not advanced at the speed which has been advertised. PV and algea would require huge investments in real estate and infrastructure and also impact the local ecosystems in a very negative way. You don't need to agree with me, but I am entitled to my opinion. Just because the research hasn't progressed as advertised doesn't mean we should stop investing in it. Aside from the fact that the fact that research money has been inconsistent considering the scale of the problem, significant progress has been laid. The barriers to success are well understood, and the theory is extremely solid (both economically and physically). I'm not sure we do require fusion on Earth...but we certainly will require some form of massive power generation from very little fuel if we ever want to make the leap to the planets (or stars) on any scale beyond probe/few people. And fusion fits that bill perfectly. that's more or less the easy part (and also a bridge to cross when we get there). It would probably be not much different than current nuclear reactors. Most of the resultant 'capturable' energy from hydrogen fusion is in the neutron by-products. We'd extract that energy through neutron moderation (graphite I'm guessing? I imagine the primary shielding would have to be solid given the nature of the machine?). Then transfer that heat to a steam or (down the road) helium turbine). First off, not 'pork barrel'. I imagine spacecraft with these, such as the focus-fusion device which may 'go live' soon. Small scale, but need magnetoelectroplasmodynamic generators to supply large scale power for electric thrusters and terawatt scale space lasers in the trans X-ray spectrum. Need also research in plasma conduits for large scale power transmission....efficiently and relatively losslessly. Maybe in space, cold dense superconducting plasma as a Bose-Einstein concentrate is practical. Put them outside the ship...stay cold...ship looks like a stryker wagon refugee from the Iraq police action but WTF. With enough power, maybe two g (64.4 ft/sec/sec) VASIMRs are possible....and compact with plasma conduit gigagauss coils. Crew can eat that shrimp grown fat from diet of GOP candidate's BS. What we do not need is another way to boil water, ammonia, mercury, or whatever 'working fluid' so as to remain prisoner to Carnot cycles more than necessary. You might think different when presented with gas prices at ten dollars a gallon. No. We have $10/gallon gas here(it's a tax thing) and it does not make me think fusion or battery electric vehicles will be cheap or ready for commercialization in the next few decades. NIF can fire a few times per day. A power plant needs to fire a few times per second. NIF targets cost tens of thousands of dollars. They need to cost cents. To actually operate a D-T fusion plant you need a first wall that can withstand a battering from neutrons and order of magnitude worse than a fission reactor and you need to be efficient tritium-breeding. "ignition" will not prove that laser-based inertial confinement fusion will ever be a viable path to produce power. NIF exists to study, refine and maintain nuclear weapons without having to resume nuclear testing. Studying fusion power is just something they were forced to do to retain funding; it is just an excuse. First they have to do it with a nuclear fission reactor. They already work, and fission reactors already fit well in submarines, which are several orders of magnitude smaller and lighter than preliminary fusion reactor designs. It is still very complex due to the lack of water in space (which is a problem for both), but fission spaceship is much more feasible than fusion. I was thinking more in terms of propulsion and weaponization. Using fusion products for propulsion by causing them to exit a chamber in one direction is a lot more efficient than so many conversion steps. Can reflective materials shaped into a suitable reaction chamber do this? We will find out. Haven't they always been saying that they will reach break even point in a year or so? Why don't they use a fission reaction to acquire the needed energy to produce a fusion reaction? Don't stars have mainly fusion reactions but also host fission reactions in them as well? Or are they specifically fusion? Pretty clear to me that you've never done any serious research yourself. Beat me to it. 1st thing i thought. Lol. If the moon ever explodes, we'll know who to look at. I agree, building a huge laser won't solve our energy needs now, or in the future. ignore cluebat, he's obviously trolling. Anyone that uses the term boondoggle is looking to troll. He's probably amongst those who think college is a waste of money and would prefer that we fall behind in everything to save a few dollars on the deficit. or .. maybe give Thorium a shot..
NIF is largely a military research installation (funded by the DoE and part of Lawrence Livermore Labs which are the primary labs for classified/military nuclear research). Their focus is "nuclear weapons maintenance" (read: getting more bang for the buck from hydrogen bombs). The hydrogen ignition 'for civilain uses' is just the public face of it. Not saying that this won't give us valuable insights - but you always have to keep this in mind when reading about NIF: Making fusion commercially viable is not high on their agenda. While NIF is a cool experiment and it may lead to many discoveries, I believe that General Fusion will achieve sustainable fusion soon (3 or 4 years). Their use of a liquid lead core solves the neutron denigration problem and serves as an efficient means to transfer heat from the reactor chamber. The steam generated is recycled to maintain the shock waves causing the reaction while the excess produces electricity. Elegant design for a reactor.